KeepSafe® 36" Wood Expansion Gate, Hrdw. Mounted "TOS"
KeepSafe® 60" Wood Expansion Gate, Hrdw. Mounted "TOS"
KeepSafe® 84" Wood Expansion Gate, Hrdw. Mounted "TOS"
KeepSafe® 108" Wooden Expansion Gate, Hrdw. Mounted "TOS"
KeepSafe® Hardware Kit Models: 36",60",84" & 108"
KeepSafe® Hardware Kit. Contains all the necessary pieces to safely mount the KeepSafe® Product. 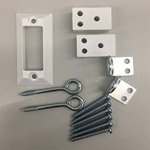 PLEASE NOTE: ALL KEEPSAFE® GATES COME COMPLETE WITH ALL MOUNTING HARDWARE SHIPPING: All kits ship $2.00 per kit.